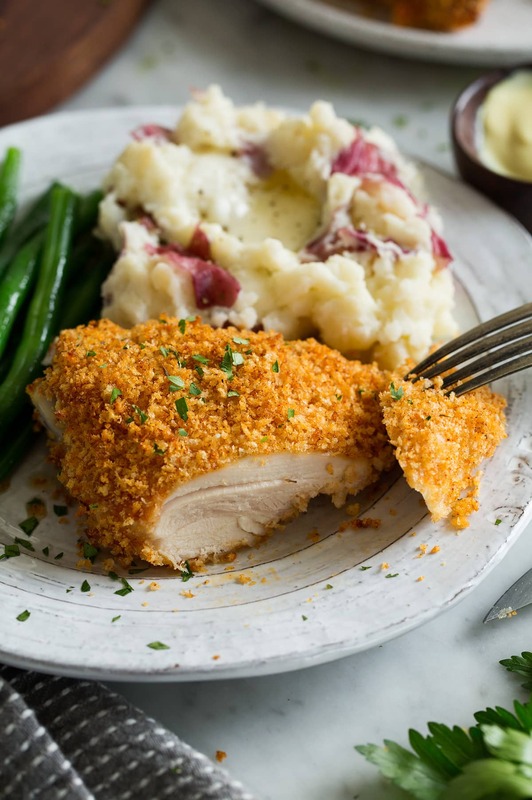 Oven Fried Chicken – all the flavors of the deep fried chicken without all the extra fat and oily mess! 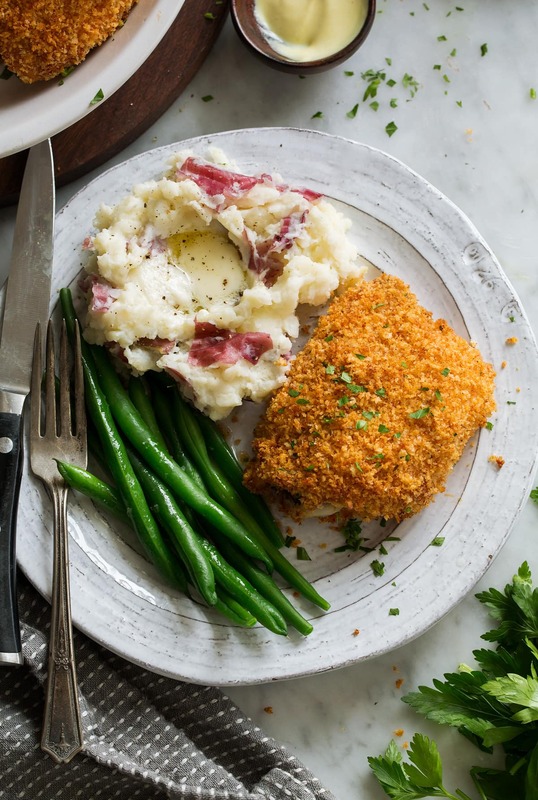 These chicken thighs are coated with a seasoned Panko and baked until golden brown and perfectly crisp! You wouldn’t believe how close they come to the real thing. This is how you do comfort food. I’ve always loved deep fried chicken but we all know it’s loaded with fat and calories. 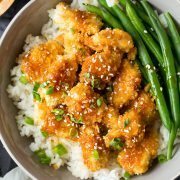 This version skips the frying and is coated with lightly oiled panko, then cooked in a hot oven instead of a pot of vegetable oil. 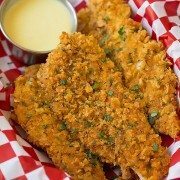 It’s deliciously flavorful and you’ll be swooning over the crispy breading and perfectly tender chicken. I added some spices and herbs to the Panko to build flavor and mimic color (the paprika helps give it a nice orange shade). And you’ll love the light kick from the cayenne (if you love heat feel free to add more!). And this really isn’t difficult to make. The hardest part here will just be waiting for it to bake in the oven! 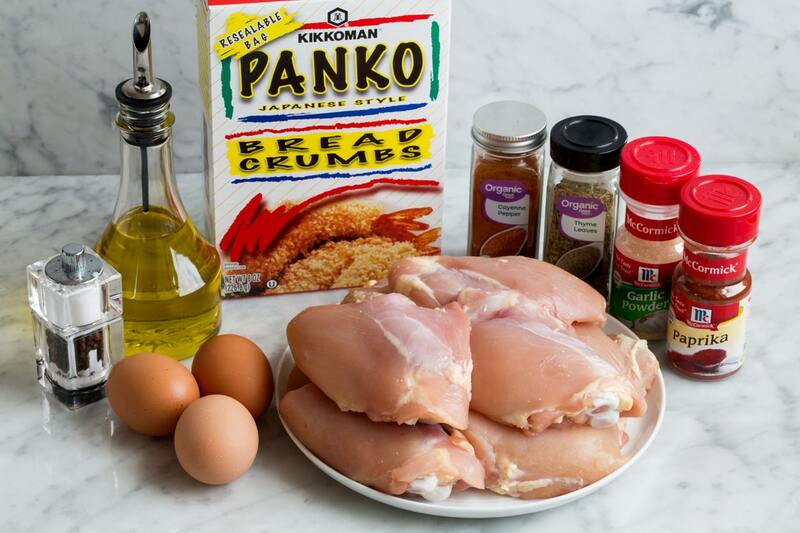 What Ingredients do You Need for Oven Fried Chicken? How do You Remove the Skin from Chicken Thighs? Removing the skin is actually really easy (and necessary for this recipe, you don’t want the extra oils). The skin mostly just pulls away then in areas where it sticks trim away with a sharp knife (HERE is a quick video that shows how). 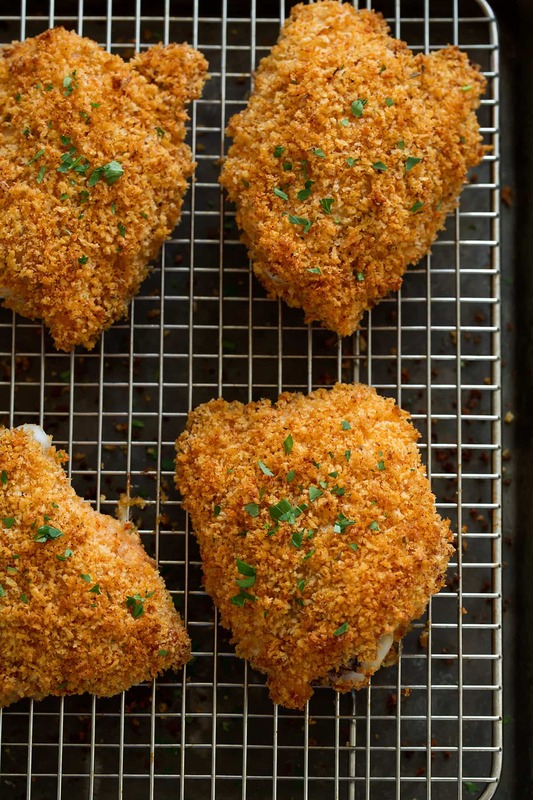 How do You Make Oven Baked Fried Chicken? Preheat oven to 400 degrees. Spray a large wire rack with non-stick cooking spray and place in an 18 by 13-inch baking sheet. 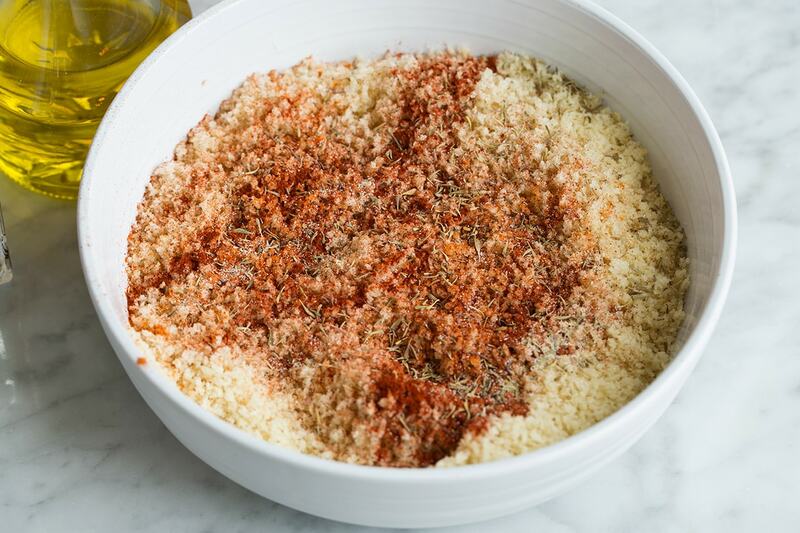 Pour Panko into a shallow mixing bowl. Drizzle with olive oil and toss and rub with fingertips to evenly moisten. Sprinkle in paprika, thyme, garlic powder, cayenne pepper and season with salt and pepper to taste then toss. In a separate shallow mixing bowl whisk together egg whites, salt and pepper until slightly frothy. 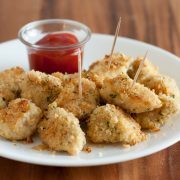 Working with one pieces of chicken at a time, dip both sides of chicken in egg white then transfer to Panko mixture and dredge both sides in mixture while pressing crumbs to adhere, sprinkle some over top as well and press. Transfer to prepared wire rack spacing evenly apart. Bake in preheated oven until golden brown and cooked through (center of thickest portion should register 165 on an instant read thermometer), about 50 minutes. Serve warm. What Works Best for the Coating? I tested with several different ingredients for the coating. I’ve tried melba toast, cornflakes and Panko, and Panko is my favorite here. Then I opted to leave out the flour for dredging because it works fine without it here, the egg whites are the perfect “glue” on their own. Can I Use Boneless Thighs or Chicken Breasts? I personally prefer the bones because they add flavor, plus they take longer to cook with bone-in so you end with a really crispy coating that has a nice golden brown color. But boneless thighs or chicken breasts will work fine too. How Long do You Cook Oven Fried Chicken? Chicken thighs with bones (about 5 – 6 oz each, after removing skin) will take about 50 minutes at 400 degrees. If using boneless skinless chicken breasts (about 6 oz each), cook time should be about 20 – 25 minutes. Boneless thighs (about 4 – 5 oz) should take about 25 – 30 minutes. What Should I Serve with This Chicken? All the flavors of the deep fried chicken without all the extra fat and oily mess. 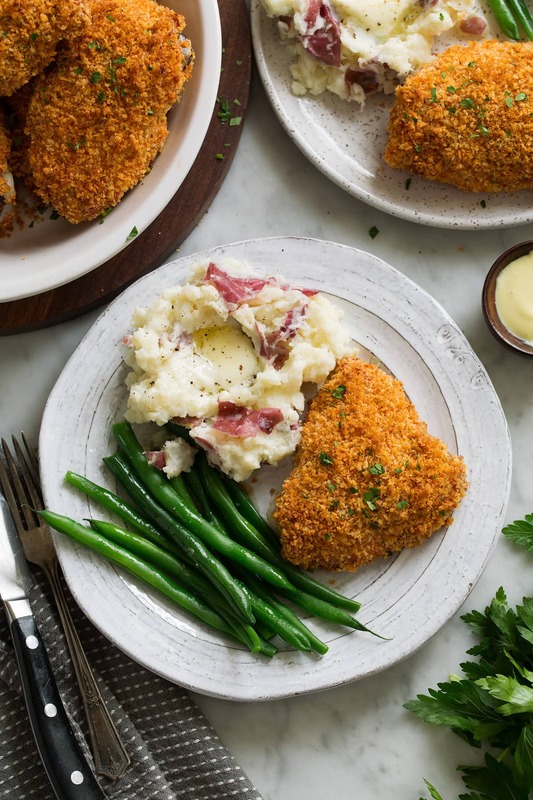 These chicken thighs are coated with a seasoned Panko and baked until golden brown and perfectly crisp! You wouldn't believe how close they come to the real thing! Preheat oven to 400 degrees. Place a large wire rack over an 18 by 13-inch baking sheet, spray wire rack with non-stick cooking spray. Add paprika, thyme, garlic powder, cayenne pepper and season with salt and pepper to taste then toss. 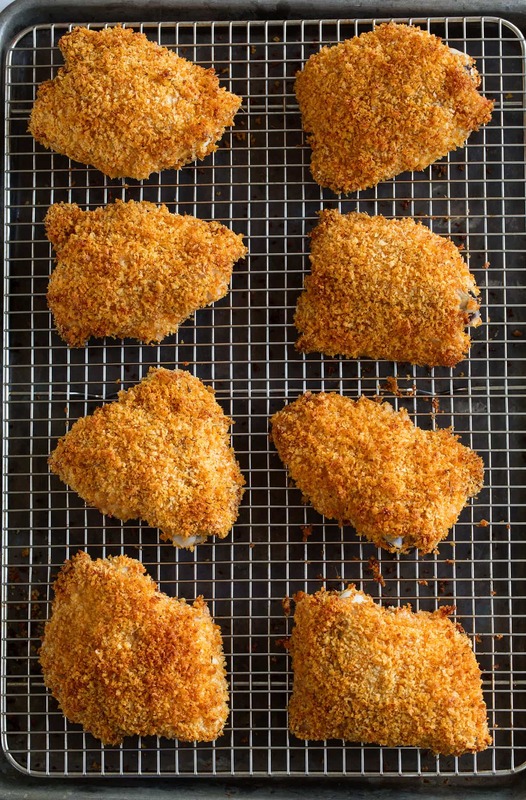 Working with one pieces of chicken at a time, dip both sides of chicken in egg white then transfer to Panko mixture and dredge both sides in mixture while pressing crumbs to adhere, sprinkle some crumbs over top as well and press. 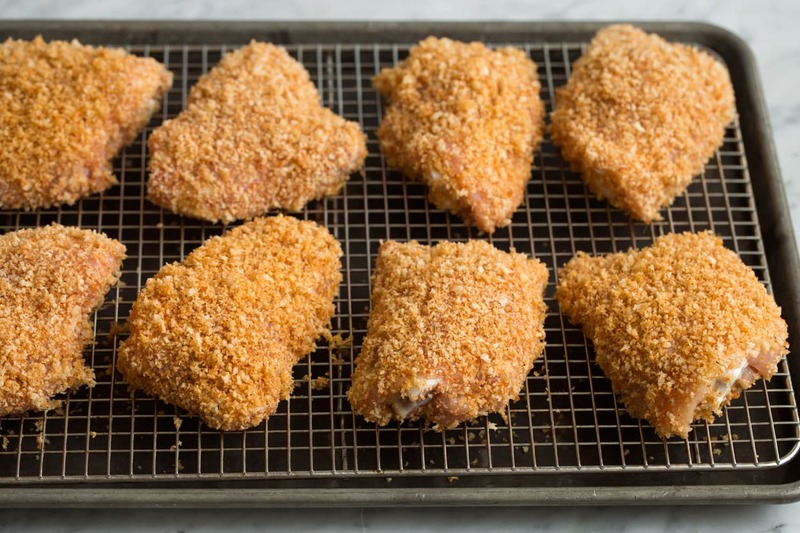 If your oven generally browns more than average and you find the panko coating is getting darker than you'd like you can drape a sheet of foil over the chicken when needed and continue to bake through. 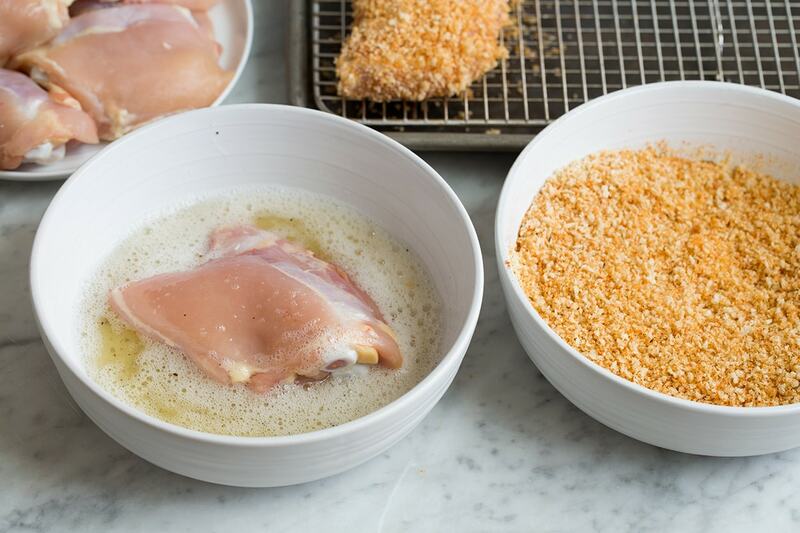 This method will work for boneless thighs or boneless chicken breasts too. Cook time will be about half but as always test to 165 degrees in center for doneness.